Description: This is what happens when you get too close to a polar bear. They look cute and cuddly, until they try to pull you through the bars of their cage so that they can eat you. This guy does a couple of nice jumps on his bike. Then I guess he gets over confident or something because his third jump does not work out so well. 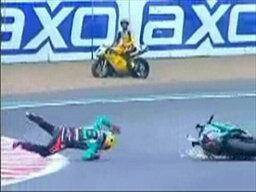 Some of the most spectacular racing crashes ever caught on tape. It's amazing that none of these people were killed or seriously injured.